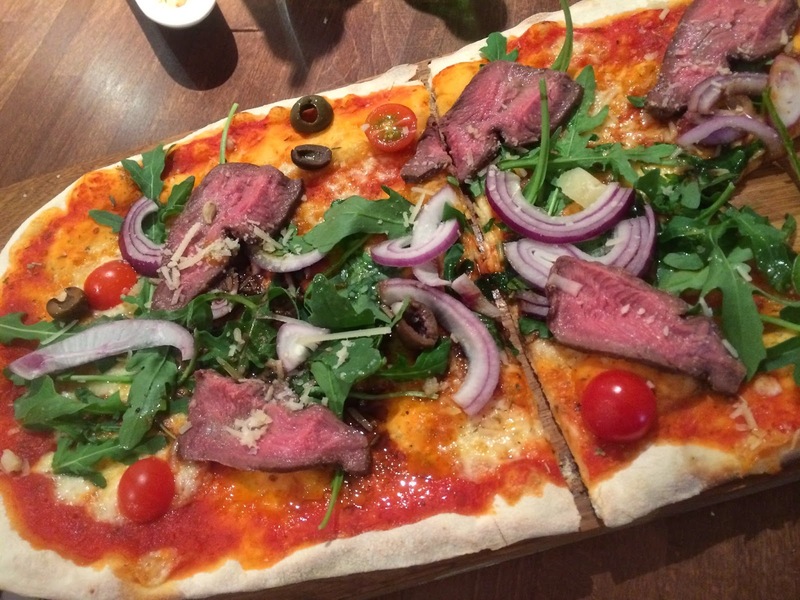 Always on the look out for exciting and varies things in restaurants I decided at a family birthday meal to go for the steak and rocket pizza - purely because it's two things I love that I haven't had in tandem on a pizza before! I cut it in half before I thought about taking the picture - it came as one big VIP style flatbread thing. I agreed to share a portion of this with the person having the deluxe pepperoni from the same range (a good spicy choice and two very distinct tastes). This was very good, and the meats had a variety of textures which was unexpected and I'd happily have one to myself. The steak looked a little pinker than I'd usually have it, but the slices were thin and certainly properly cooked so I tucked in. The pizza base was crisp and nice but essentially background. The tomato sauce was good, but the sections with balsamic in it were extra special. All the ingredients were fresh and only the onion was a little overpowering, but it was sparse enough to be enjoyably so. The steaks were the main event. Initially I'd thought there were too few, but each one was satisfying in itself. They retained their flavour well, and the texture was soft enough that you could bite through them without having to worry about sorting them out with the pizza cutter before eating. It was certainly a different experience - more similar to eating lots of steak entrée than a pizza. The rest of the ingredients served as the solid base for this and it's something I'd consider having again even if there were other things on the menu I fancied. We really don't make it to Prezzo very often (in fact Bromsgrove is the only place I remember seeing one but they do have a store locator) so I probably won't get to have another one of these, but as we have pizza kits for home it's certainly an idea that I can steal and do!